Sammy Luftspring (1916-2000), a skilled boxer who fought with pride sporting the Star of David on his boxing shorts, was the son of working-class Jewish parents from eastern Europe. Luftspring grew up in St. John’s Ward, Toronto, a primarily Jewish neighbourhood in the early 20th century. 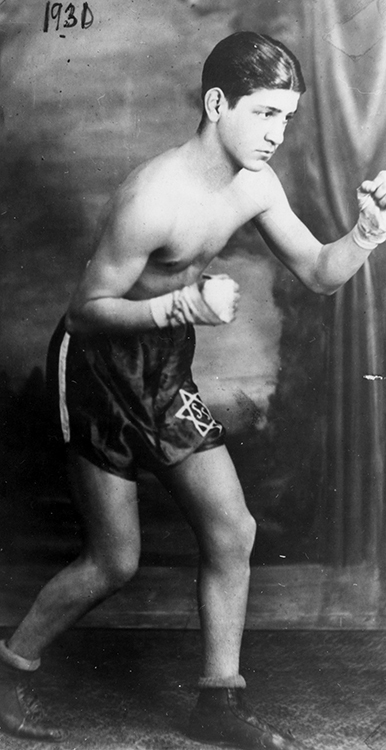 He began boxing at the Young Men’s Hebrew Association and competed in matches in 1932. Between 1932-36, he only lost five of 105 fights. In 1936, after being asked to represent Canada at the Berlin Olympics, Luftspring decided not to participate in the Games to protest the anti-Semitism of Nazi Germany. Luftspring turned professional in 1936 and won the Canadian Welterweight Championship in 1938, a title he held for two years. In 1940, in a fight against Steve Belloise in New York, an eye injury that left him blind in one eye ended his boxing career. Luftspring stayed with boxing, working as an accomplished referee. “We would have been very low to hurt the feelings of our fellow-Jews by going to a land that would exterminate them if it could.” (July 7, 1936). Learn more about Luftspring at the Ontario Jewish Archives website. Read more about Luftspring on the Ontario Sports Hall of Fame website. Learn more about the 1970 boxing match (on the Boxing.com website) that involved Luftspring as referee.